A budgetary decision by the Fremont County Board of Commissioners last fall to invest some dollars in electronic recycling has paid significant dividends. After repeatedly hearing stories of illegal dumping of television sets and other computer equipment across Fremont County the commissioners decided last fall to partner with the Upper Arkansas Area Council of Governments (UAACOG) Recycling Program. UAACOG Recycling Coordinator Beth Lenz told the commissioners that she was scheduling a couple of electronic recycling events in 2016 in Florence and Cañon City. Because consumers have to pay often steep prices to recycle TV’s and computer equipment, the commissioners decided to budget $7,500 in 2016 to help subsidize the consumer cost of electronic recycling. Lenz reports the first recycling event in Florence on April 9th showed strong consumer response to get rid of their old electronics. Lenz said they collected 10,560 pounds of electronic equipment at the Florence event which was by far the most successful event UAACOG has ever held in Fremont County. Lenz said of that total, over half of it—6,254 pounds were old television sets. The Florence event utilized $2,500 of the county’s budgeted funds which allowed consumers to pay half the going rate to recycle old TV sets and computers. Lenz said the other $5,000 in county funds will be used for a similar electronic recycling event in Cañon City next September. Fremont County Commission Chairman Ed Norden said this is exactly the response the Board of Commissioners was hoping for by investing money from the county’s Recycling Fund that directly benefits consumers and addresses the problem with illegal dumping. He said often times the county ends up paying the cost anyway when TV sets are dumped along county roads. Norden also credited Fremont County Manager Sunny Bryant whose efforts in 2015 increased collections of tipping fees from the landfill and transfer station in Fremont County. Norden said the increased revenue in the Recycling Fund allowed the Board of Commissioners to budget the $7,500 for the electronic recycling subsidy. It took three readings and several amendments before the Fremont County Board of Commissioners settled on the language in a county ordinance that will seek to control indoor and outdoor home cultivation of marijuana. When the ordinance was tabled a second time at the March 22nd meeting the commissioners were concerned that a limit of 99 plants was still too excessive. District 2 Commissioner Debbie Bell had referred to a 36 plant limit imposed in Pueblo County as a guide. 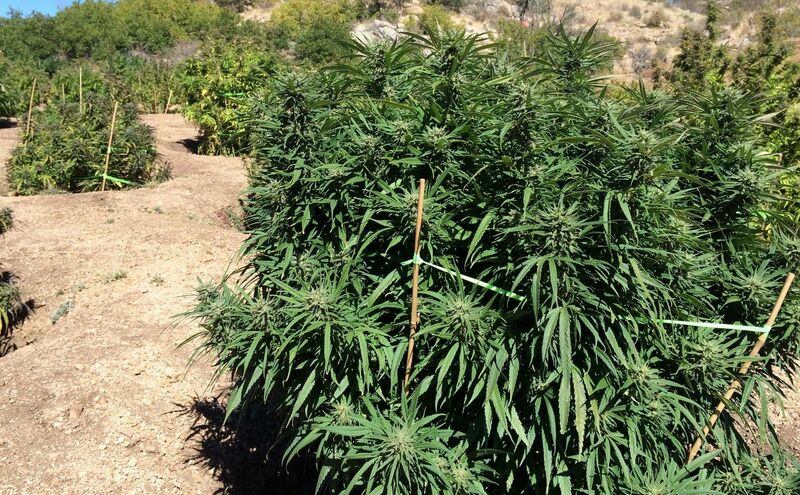 In the end the ordinance adopted in Fremont County places a limit of 36 marijuana plants cultivated outdoors for persons owning ten acres of property or less. If someone is the owner of 10 acres or more they will be able to grow up to 99 plants. Commissioner Bell said the board did its best to compromise in recognizing the desires of medical marijuana caregivers as well as neighbors who have to put up with marijuana cultivation. Bell said the ordinance is not written in stone and if problems present themselves the commissioners can go back and amend it again. The ordinance went into effect last Sunday, April 17th. It also requires that medical marijuana caregivers be registered with the county through the Planning and Zoning Department. It was the licensing of ambulances for agencies in western Fremont County that stirred controversy at the April 12th commissioners’ meeting. The Deer Mountain Fire District proposed to the Board of Commissioners that they be licensed for Advanced Life Support (ALS) ambulance service and be designated as the agency to serve not only the Deer Mountain Fire District but also the Highway 50 corridor from Parkdale to the Chaffee County line. Arkansas River Ambulance (ARA), previously known as Arkansas Valley Ambulance, has been embroiled in internal controversy amongst board members for the past two years and has been challenged in recent months to maintain service. A Fremont County District Court ruling was believed to be the final death knell for ARA but board members who are now in charge told the commissioners that they have every intent of reviving the agency and sought a license for ALS services. County Medical Director Dr. Paul Numsen acknowledged that he believed the animosity between ARA and Deer Mountain has gotten in the way of patient care. He said he felt like he was constantly putting out fires the last 2 ½ years. It was Numsen’s recommendation not to relicense Ark River Ambulance. However, when he was asked if he would continue to serve as medical director for Ark River if the commissioners chose to relicense the agency, Numsen said he would agree to do so. With the Deer Mountain Fire District arguing to be the sole licensee in order to respond to the Highway 50 corridor, Commission Chairman Ed Norden said it sounded like Deer Mountain was giving the Board of Commissioners an ultimatum that their plan wouldn’t work unless the Board anointed them as the only agency to cover the Highway 50 corridor. Norden said, “I think this board is very uncomfortable with that ultimatum”. District 2 Commissioner Debbie Bell said she was uncomfortable being put into the middle of the fight between ambulance companies saying, “I really have no interest in being a pawn in what I consider a hostile takeover”. The Board of Commissioners ultimately issued ambulance licenses to both Deer Mountain and Ark River urging them to sort out their differences and prioritize patient care as the primary goal. Took no action on a temporary use permit for Singleton Lee who wanted to stage Super Bud Bowl III promoting marijuana businesses on the weekend of April 22nd and 23rd. Lee withdrew his application telling the commissioners that the Desert Reef Hot Springs off of State Highway 120 east of Florence had withdrawn its offer to lease its property for the event. 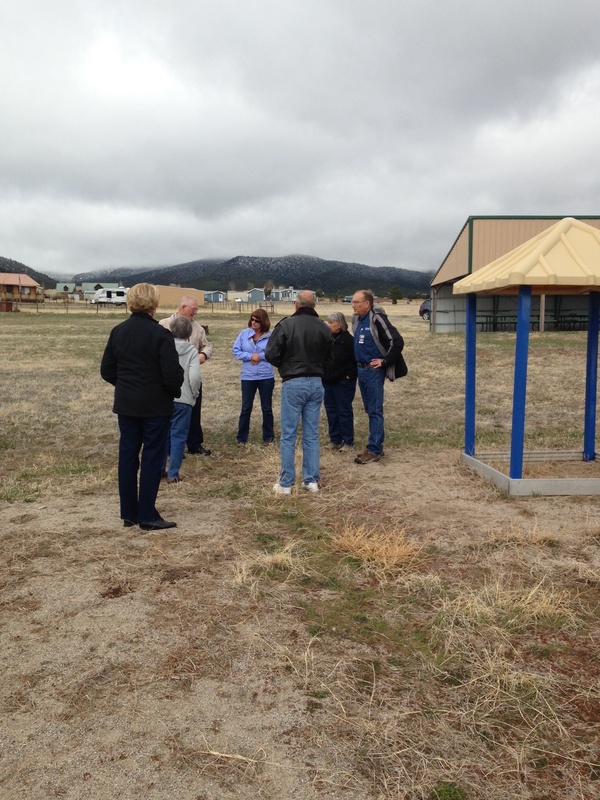 The Fremont County Commissioners met on site at the Western Fremont County Park at Howard April 11th. They met with community volunteers to discuss park priorities for park improvements this spring and summer. As part of a 2016 goal to address maintenance issues in park properties that Fremont County owns the Fremont County Board of Commissioners made a site visit April 11th to Western Fremont County Park at Howard. The park property is in the Acres of Ireland subdivision that looks down across the Arkansas Valley south of Highway 50. Howard residents who have volunteered to serve on a local committee to revitalize the park say they want to emphasize the area as a community park for all residents in western Fremont County. Mowing and minimal maintenance of the park was originally undertaken by a homeowners association but in recent years most of the work was performed by a single volunteer. Residents told the Board of Commissioners at a pair of town hall meetings this winter that usage of playground equipment, basketball court, and a picnic shelter had declined in recent years because of an infestation of puncture vine. The residents say they want herbicide control to resume and a county weed crew began work last week to start spraying in the park area. In addressing the 2016 goal of dealing with parks maintenance the Board of Commissioners is in the process of hiring a maintenance person initially to work 30 hours a week this spring and summer. That person will deal with maintenance on county property at Pathfinder Regional Park, the B.F. Rockefellow Ecology Park south of Cañon City, the Fremont County Airport War Memorial Park, and Western Fremont County Park. During the site visit to Howard the commissioners and County Manager Sunny Bryant discussed weed control, excavating around playground equipment, placing new crusher fines on the playground and a park trail, summer mowing, and repairs to picnic tables at the picnic shelter. Park Committee volunteers Shari Mohr, Linda Pulley, Nancy Hollen, and Fred Kroll met with the commissioners to discuss park improvements. The Fremont County Board of Commissioners is cooperating with the Upper Arkansas Area Council of Governments (UAACOG), and the Florence Grassroots and Clean-Up in sponsoring an electronics recycling event this Saturday, April 9th, at Florence City Hall, 600 W. 3rd Street. During this event, you will be able to recycle your televisions, computers, printers, and other small electronics at a reduced cost. The electronic recycling reduced prices include: Computer monitors--$10, CPU’s--$5, and desktop printers--$5. Small electronics, such as stereos, can also be recycled for $5. Keyboards, cords, cell phones, ink cartridges, mice and other small peripherals will be taken at no charge when you recycle other components. Televisions can also be recycled at this event at a reduced cost. The current standard cost of recycling a television is over $2 a diagonal inch, but at this event, the cost will be $1 per diagonal inch, thanks to assistance from Fremont County. The Board of Commissioners budgeted $7,500 from the county’s Waste Disposal Fund in 2016 to aid in electronics recycling events across Fremont County. The commissioners recognized that the county and private property owners are already dealing with the cost of illegal dumping of electronics on county road rights of way and private rural properties. Colorado implemented a landfill ban on electronics in July of 2013. Waste electronics and computers from residential and non-residential sources cannot be disposed of in solid waste landfills in Colorado. Harmful chemicals can leach out of this waste and contaminate soil and groundwater. Electronics will be recycled by Southern Colorado Recyclers, a Colorado-registered electronics recycler, as required by CDPHE. All electronics will be recycled responsibly and all hard drives will be destroyed. Hours for the electronics recycling event this Saturday at Florence City Hall are from 10:00 a.m. to 2:00 p.m.
For more information, please contact Beth with UAACOG’s Regional Recycling Program, Upper Arkansas Recycling at 275-1675. 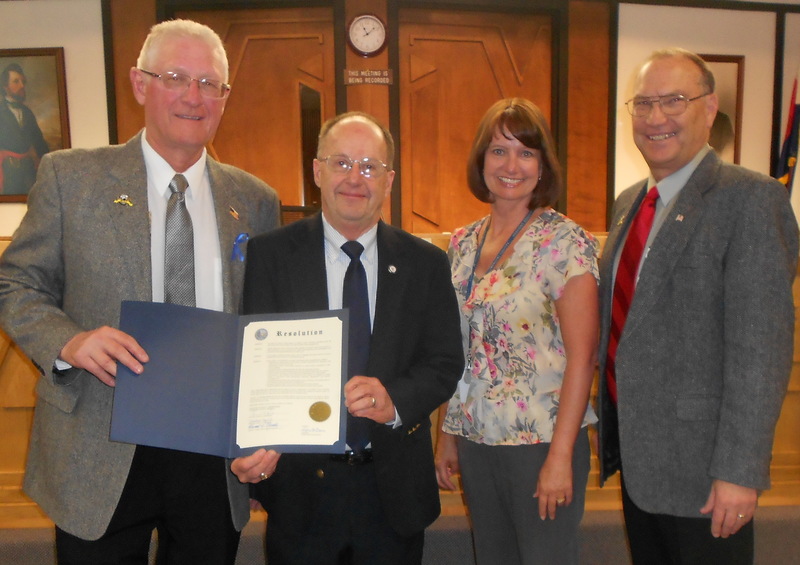 The Fremont County Board of Commissioners approved a resolution March 22nd honoring George Sugars for his seven years of service as County Manager. During his tenure Sugars led the restructuring of several county departments; updated and streamlined the county budged process; implemented a comprehensive energy conservation program; and oversaw the purchase and renovation of the Garden Park Building for the Public Health Department, Sheriff Investigations Division, Weed Management, and Emergency Management Office. County Finance and Budget Director Sunny Bryant succeeds Sugars as County Manager on April 1st. Consideration of a zone change in the Four Mile area southeast of Cañon City is the only item to be taken up by the Fremont County Planning Commission at their April 5th monthly meeting. Bill Balhiser is the owner of an agricultural piece of property west of the intersection of Grandview and Steinmeier Avenues in the Four Mile area. Balhiser is requesting a zone change from Low Density Residential Zoning to Agricultural Rural Zone District. The property was originally part of the Canon Creek Ranch development. The original plan called for the property to be developed into 28 residential lots with curb, gutter, and sidewalks. Balhiser wants to revert the property back to more agricultural uses by dividing the property into only two lots with a minimum acreage of 4 ½ acres on each lot. The Planning Commission meets at 3:00 p.m. Tuesday, April 5th, in the County Commissioners meeting room on the lower level of the County Administration Building. Despite changes to a proposed ordinance regulating marijuana cultivation in unincorporated areas of Fremont County, the Board of County Commissioners decided to table the ordinance a second time. District 2 Commissioner Debbie Bell said the Board wants to make sure they “get it right” before adopting something that may not address all the concerns. Language that was amended after the first reading on the ordinance on March 8th drew praise from medical marijuana caregivers at the March 22nd commissioners’ meeting. The amended ordinance dropped all references to acreage limits of five acres and 20 acres and instead focused on a limit of 99 marijuana plants for caregiver grows. Nathan Robinson, who grows marijuana as a caregiver year round, thanked the commissioners saying the changes represented a good balance. William DeSpain who also protested the original limitations said he appreciated the revisions. But regarding personal use marijuana growing, DeSpain said it boils down to neighbors being good neighbors. Commissioners Bell and Ed Norden expressed last minute reservations. Norden said while the Board attempted to address concerns raised by caregivers and medical marijuana patients who grow their own plants he feared the commissioners may have swung too far in the other direction. Bell agreed noting that Pueblo County has a 36 plant limit for marijuana caregiver grows and wondered if that was a number Fremont County needed to move towards. Bell said “there are a lot of people who do not think a 99 plant limit is a good compromise because it is way too many”. The commissioners voted to table the ordinance again until their April 12th meeting. Commission Chairman Norden said following more conversation by the board they hope to have the latest version of the revised ordinance posted on the county web site by April 1st so citizens can review any changes. The commissioners approved an engagement agreement with George K. Baum Company at their March 22nd meeting for the financing of the Fremont County Jail renovation project. Since voters approved a one cent sales tax increase for the Sheriff’s Department, Sheriff Beicker has been accumulating cash reserves to help finance a complete renovation of the jail’s kitchen and laundry area. County Finance Director Sunny Bryant said that despite the Sheriff’s efforts to set aside cash, a finance package will still be needed to complete the $5 million project. George K. Baum will set up a finance package over a seven year period to pay for the renovation using proceeds from the sales tax. Bryant said the project needed to be financed over seven years so the project can be paid off before the Sheriff’s one cent sales tax reaches its’ ten year sunset. Adopted a proclamation declaring April to be observed as Child Abuse Prevention Month. Local officials and businesses are once again gearing up for the annual Spring Clean-Up and Canon Proud Campaign. A limited number of trash vouchers for free disposal of household trash, furniture, construction debris, brush, logs, leaves and yard waste will be available on a first-come, first-served basis to Cañon City and Fremont County residents beginning on March 21st and ending on April 30th. Trash vouchers are good for free disposal of ½ ton (one regular pick-up truck bed) at Twin Enviro’s “Phantom Landfill” at 2500 Fremont County Road 67 (north of the airport), Penrose, 372-6671. (Amounts of trash in excess of ½ ton will be charged extra on site.) Hours of operation are from 8:30 a.m. to 4:00 p.m. Monday through Saturday. Cañon City residents may pick up a voucher from 8:00 a.m. to 5:00 p.m. Monday through Friday at City Hall, 128 Main Street. Persons living in unincorporated areas of Fremont County may pick up a voucher from 7:00 a.m. to 5:00 p.m. Monday through Thursday in Room 106 of the Fremont County Administration Building, 615 Macon Avenue. Proof of residency is required when obtaining a voucher. Only one voucher will be issued per household. Free disposal will end on April 30, 2016 at 4:00 p.m. All loads must be covered, and no commercial haulers or contractors qualify for these vouchers. The City of Florence will sponsor their city wide cleanup in late April. R.D. Recycling, located at 1501 High Street (719-641-0630 or 275-2052) will accept appliances Monday through Saturday from 9:00 a.m. to 3:00 p.m. for free disposal. They will also pick up large loads in bulk. Brass, aluminum, and copper will be purchased at prevailing rates. They will purchase automobile batteries for $5 each. All of the Spring Cleanup partners DO NOT accept any tires, TV’s, computer equipment, other electronic equipment, or hazardous waste. An ordinance to regulate home cultivation of marijuana in unincorporated areas of Fremont County will go back before the Board of Commissioners on second reading with proposed revisions. At the March 8th first reading of the ordinance a number of people addressed the board saying the marijuana regulations would particularly create an undue hardship on medical marijuana patients who grow their own marijuana or on their caregivers. Fremont County Commission Chairman Ed Norden said the amended language in the ordinance drops references to acreage limitations and focuses instead on limiting the number of plants to be cultivated. He said the changes also reflect more latitude for caregivers of medical marijuana patients. Norden said while the commissioners are trying to respond to the desires of those who cultivate marijuana for medical purposes they still want to maintain the integrity of the ordinance that address the negative impacts to next door neighbors. A red-lined copy of the amended ordinance has been posted on Fremont County’s home web page at www.fremontco.com so the public can review where the language has been changed. The ordinance will come up for consideration on second reading at the Board of Commissioners’ regular meeting at 9:30 a.m. next Tuesday, March 22nd. The Board expects to receive additional public comment at that time before any final adoption. After listening to public comment for nearly two hours Tuesday morning the Fremont County Board of Commissioners indicated they would consider how new marijuana regulations might be modified to address some of the concerns raised by medical marijuana patients and caregivers. The ordinance that was discussed on first reading would put into place a comprehensive set of regulations governing the cultivation of both medical marijuana and marijuana for personal use in the unincorporated areas of Fremont County. As written the ordinance would restrict the number of marijuana plants that could be grown outdoors and minimum acreages required for cultivation. It would also require screening from public view. The ordinance also addresses indoor cultivation of marijuana. Most of the opposition voiced at the meeting came from caregivers and individual growers who use what they grow. Karen Hunter, a registered caregiver for five medical marijuana patients, said the restrictions will force outdoor growers inside and push people to grow on public lands. Darren Jones said requiring a minimum of five acres for caregiver grows would “cut the legs off some of us”. He said limiting caregivers will be hardest on patients who can’t afford to go into the store (and buy medical marijuana). Chris Garrison and Scott Strong, both military veterans, said the ordinance will punish the people who register and comply. Both spoke of how medical marijuana has proven to be a great medical benefit compared to the debilitating drugs prescribed by the Veterans Administration. The commissioners did hear support for the ordinance from people who said tougher regulations are needed for people who want to grow marijuana and ignore the impact on neighbors. Beverly Krieger who lives in the Meadowdale Ranch subdivision along County Road 3 at Parkdale said some neighbors have moved in specifically to grow marijuana. She says if they violate state law and use well water to cultivate marijuana it could compromise all of the neighbors’ water wells. Sheriff Jim Beicker said he supports the ordinance and thinks the restrictions are reasonable. Noting that violations of the ordinance would be a petty offense subject to fines, the Sheriff said the intent is not to put anyone in jail. Commission Chairman Ed Norden said he appreciated the thoughtful suggestions the citizens offered particularly regarding the impact on medical marijuana patients and caregivers. But Norden said the commissioners recognize that regulations are needed. He said “People are concerned about their neighborhoods and a threat of people moving in for no other purpose than to grow marijuana”. He added that without regulations, “There is an unfettered explosion of people doing whatever the hell they want”. Rob Harper of Cañon City urged the commissioners to consider some reasonable change to the ordinance restrictions saying that if the ordinance is approved as written, “You’re only going to force people to go underground”. The commissioners took no action and said the ordinance will come back before the board on second reading with some anticipated changes. Commissioner Norden said once amended language is proposed a second draft of the ordinance will be available for public inspection on the county’s website at www.fremontco.com.